On Tuesday morning Team Canada’s U20 men’s ice hockey team invited 30 players to the ‘selection camp’ for the upcoming World Junior Championship. For the first time in a while, there were no Canucks prospects on the invite list. Canucks teenagers Jared McCann and Jake Virtanen would’ve been slam dunk invitees if they were playing in major junior though. They’re NHL players now so they won’t take part in the selection camp, though that doesn’t necessarily mean that McCann and Virtanen won’t represent Team Canada at the 2016 tournament in Finland later this month. “We’ll see where we’re at if they get asked to play on the World Junior team, we’ll make that decision then,” Canucks general manager Jim Benning said in November when asked whether Virtanen and McCann might be released to Team Canada for the World Junior tournament. The NHL’s annual holiday roster freeze goes into effect on December 19, so the Canucks have a few weeks yet to decide whether or not to send Virtanen and McCann (or one of them) to the tournament. We know that Scott Salmond of Hockey Canada has been working the phones and diligently checking in on the status of McCann and Virtanen for weeks now. Canada hasn’t closed door on Fabbri, Virtanen, McCann for world jr. Talks continue with Blues, Canucks respectively. It’s my view that Virtanen – if he’s healthy after taking a Ryan Getzlaf cross-check to the ribs on Monday night – should be a serious candidate to be given a couple of weeks off from NHL action to go dominate against players in his age group. Meanwhile the idea of sending McCann to Finland for the prestigious international tournament should be a non-starter. It comes down to two things, really: depth and performance. With Brandon Sutter out of the lineup with injury, the Canucks have needed McCann to step up and hold down a key role as a middle-six pivot in recent weeks. Though his hot offensive start to the season has cooled in November, McCann’s two-way results have been steadily improving and he’s seen a corresponding increase in average ice time per game. Even when Sutter returns to the lineup, McCann has demonstrated that he’s reliable defensively and that he has good chemistry with Brandon Prust and Derek Dorsett. He can hold down a fourth-line role, and that’s arguably even the most sensible spot in the lineup for him. McCann is on an accelerated learning curve, and fits in nicely with the Bo Horvat apprenticeship program, which we saw outlined last season. The Bo Horvat apprenticeship program does not include a mid-season stint with Team Canada’s U20 team. The Canucks’ decision not to send Horvat to the World Junior tournament last season paid dividends in the second half of the campaign, when the rookie pivot seemed to find his game and become a consistent offensive threat down the stretch. I see little reason why the club would handle McCann any differently. In fact, I’d argue that McCann has made a larger impact in his first handful of games as a 19-year-old than Horvat did. It’s a bit of a different story for Virtanen. Though the physical winger has shown flashes of being dynamic through the neutral zone, it seems that the big hits and the heavy physical game that he brought repeatedly in October has fallen off somewhat. He’s also been a more regular healthy scratch, watching three games in November from the press box, including two of the club’s past four contests. Vancouver is also far deeper on the wing than they are down the middle of their forward group. In addition to having Sven Baertschi – who has been swapping places in the lineup with Virtanen over the past week – the Canucks have a trio of NHL-ready wingers in the American League in Brendan Gaunce, Alexandre Grenier and Hunter Shinkaruk. Ronalds Kenins also recently returned from injury, and could prove useful if the Canucks want to amp up their forechecking. 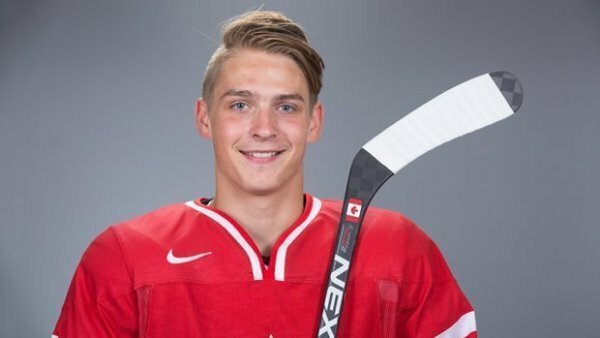 If Virtanen is healthy in time for the tournament, it seems to me that he could benefit from being the biggest fish on international ice for Team Canada for a couple of weeks. He hasn’t been all that productive or all that heavily relied upon by the Canucks over the past month, and scoring some goals and mauling some younger opponents could help jumpstart his confidence. Based on the way the Canucks roster is constructed and on McCann and Virtanen’s recent performance, it seems fair to suggest that while Virtanen could conceivably benefit from a two week stint with Team Canada’s U20 team, the Canucks can’t afford to spare McCann. Virtanen taking a break could seal the deal on Baertschi as well. If he get’s passed up on the depth chart by Shinkaruk or Gaunce, then the writing is on the wall, and i’d take a chance putting him on waivers. Virtanen could benefit by being one of the best offensive players on a team for a few games. He hasn’t shown the flash that he did in junior, and seems focused on playing responsibly and physically. Maybe a reminder that he is a damn skilled player as well might spark him for the second half. To me — rightly or wrongly — it feels like Virtanen is still trying out for the Canucks, while McCann is past that point and evolving his game at the NHL-level. I have always felt like Virtanen has been given opportunities more than McCann based on his draft position. In the preseason, I think McCann showed that he belonged, while Virtanen was so-so. McCann forced his way onto the team, while Virtanen could just as soon have been sent down. The optics of that would have been bad, since it would be an admission that the guy drafted 24th overall is looking better than the guy drafted at 6th overall. So they gave Virtanen a spot on the team, and have sold it as a youth movement. I honestly believe that if McCann didn’t exist, Virtanen would have been sent down at the beginning of the season. I think these same bad optics are holding the team back from sending Virtanen down or sending him to the World Juniors – management wants it to seem like all the young kids (especially their prized 6th overall pick) are coming along swimmingly. I agree with this article, though. Virtanen should go to the World Juniors and find his offensive game. I would be overjoyed if he went there and was among the team leaders in points. My worry is that he will go there and struggle to put up points, which would only expose him to even more scrutiny. Agreed. Although I would love to see both players represent Canada atWJC McCann is a. Player Canucks can not afford to lose off roster. Maybe we would get a chance to see both Hunter And Grenier being rotated in/out of line up. With Grenier turning RFA it would be nice if he were given a real chance to prove himself. We could include Gaunce in here as well. He had good camp and did not look out of place in the game he scored. If Virtanen went to the WJC and missed 10 NHL games, he’d still be getting 4-7 games against the world’s best junior players. Can’t see why Benning shouldn’t let him attend if he makes the roster. If I was Virtanen, I’d want to play in the U20 because this is his last chance at the WJC whereas he has an entire NHL career ahead of him. To me the injury further tips the scales toward sending him to the WJC if he has recovered enough by then. It might give him a chance to get back up to speed without getting physically punished by grown men in the NHL. Keeping an underperforming Virtanen on the team diminishes management credibility and team cohesion. Having Virtanen and Baertschi on the team does not give the team a better chance to win and punishes those draft picks that worked off their behind in the A. Send Virtanen, keep McCann, trade Sbisa, bench Dorsett, waive Baertschi, book tee times for next May.